Names such as THE RUNAWAYS, GIRLSCHOOL and VIXEN are usually being mentioned as the most popular all-female bands. And they are right, but people always seem to forget ROCK GODDESS. A band, who was very popular at the same time THE RUNAWAYS and GIRLSCHOOL were famous and even before VIXEN got into the picture. Reason enough to give you all the facts about the Turner sisters, and not to forget their father, John Turner, the band and their fascinating side projects. Let's take you back to 1978, when ROCK GODDESS was founded. In '78, Jody Turner (guitar/vocals), inspired by the success of THE RUNAWAYS, decides that she wants to be a musician in a rockband. A drummer was arranged the same day. Her younger sister Julie takes a seat behind the drum kit to rattle those pots and pans. School friend, Tracey Lamb, joins the sisters to play the bass and Donnica Colman is the last missing link in this first line-up. She plays the keyboards. Through a friend of theirs, Karine, the band is asked to appear on a sampler album. In the meantime, father John (Turner) becomes the manager of the band. He owns a music store in Wandsworth, London. In the backroom of this music store they do their rehearsals. After awhile, they decide to take Karine's offer and record "Make My Night" for the "Making Waves" compilation, which was released on the Girlfriend record label. Karine, who's actually the singer for ANDROIDS OF MU, arranged a tour support for ROCK GODDESS with A.O.M and the GYMSLIPS. Just imagine we're talking about two girls of thirteen years old and drummer Julie only being nine years old, when they formed this band. No wonder, John Turner wanted to keep an eye on his young (and good looking) daughters. 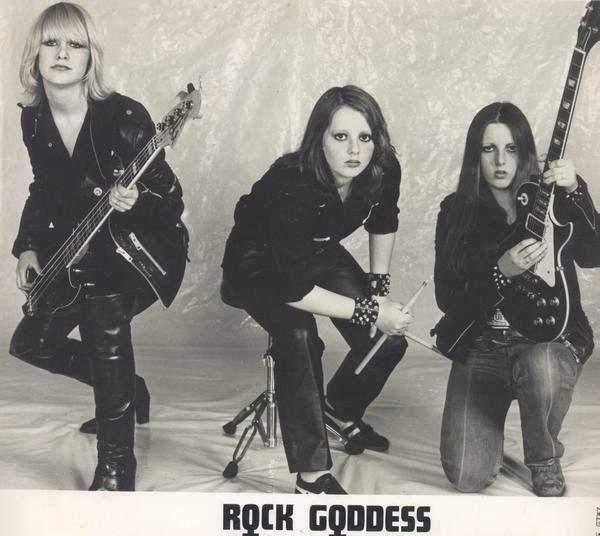 Their first gig as ROCK GODDESS was in Club 101 in Clapham, South London. From that moment on, everything seems to go very fast. Vic Maile gets interested in the band and he produces their first four track demo tape. It's 1982 now and the band is put on the bill for the famous Reading festival. They perform a smashing gig and A&M Records signs the girls for their debut album. Something Donnica won't be a part of, because she quits before the four track demo. Their first album is called "Rock Goddess" and not "The Goddessa File", which was the intention first. But before the release of their S/T album, they release their first single "Heavy Metal Rock'n'Roll" b/w "Satisfied Then Crusified" (also released as a picture disc). The ten songs on their debut album show us a band that like their rock hard! Here and there a ballad, but fact is the girls really live up to their band name. In between, Jody and Julie appear as background vocalists on the SAMSON 7" "Living, Loving and Lying", which is the flip side of "Red Skies". In '83 they release a second single from the album, which is called "My Angel". The 7" is backed with "In The Heat Of The Night" (a non-album track). On the 12", we find back another non-album track, which is called "Our Love Is Gone". As a limited edition, it comes with a flexi-disc containing samples from "My Angel", "Make My Night", "Heartache", "Back To You" & "Heavy Metal Rock'n Roll". The flexi is packed in a poster bag. You'll get the picture of a very successful young band here, but the sun doesn't always shine for the three goddesses. After their first single, they have to cancel their tour with UFO. Reason is, that Julie still has to go to school and according to the law she's only allowed to play six gigs in a row and the tour with UFO lasted for eight days. Sad but true! However, after the release of the album, Julie's finally allowed to go on tour and the band tours as support act of DEF LEPPARD. Another black page in their history is the departure of Tracey Lamb. But before Tracey quits the band, they decide to hire a fourth member to fill up the sound a bit. Her name's Kat Burbella and she's the second guitar player. After the tour with DEF LEPPARD, ROCK GODDESS gets the chance to do a tour with FASTWAY. Tracey decides to stay until the tour is over, but the Turner sisters have to find a replacement soon, because they're planning a second album. However, Tracey Lamb doesn't disappear from the scene long. Her departure was forced due to musical differences, so the story goes. It's no secret though, Tracey couldn't get along with Jody anymore. Tracey formed her own band called SHE. Together with Kat Burbella on guitars (who also came from ROCK GODDESS), Jackie Bodimead on vocals (former STRATEGY and CANIS MAJOR, with whom she released a 7" and one album), Suzie Roll on drums and Chris Bonacci on guitar. The name SHE was chosen by the readers of England's leading rock magazine Kerrang!. Unfortunately, SHE never stepped outside the English clubscene. In '84, Bodimead and Bonacci join GIRLSCHOOL to record their album "Running Wild". Bonacci wasn't replaced, but Bodimead got replaced by Gudrun Laos, who we will later find back in the German band LAOS, with whom she made one album, called "We Want It". Right after these changes, Suzie Roll tells Tracey she wants to quit the band, too. She's being replaced by ex-LIMEHOUSE drummer Michelle Drees. This collaboration didn't last very long and also Michelle quits the band. Some SHE songs, the fans will probably remember from those old days are "Wishing", "Broken Dream", "Times Are Hard" and "Feel The Power In Me". SHE disbanded in '85 and Tracey starts a new project, called THE PERFECT MOTHERS together with Kate Stephenson (who plays drums, rythmn guitar and sang lead vocals). THE MOTHERS wrote many songs together as a duo and recorded various demos, but never played live. In 1986, Tracey joined GIRLSCHOOL - one of the pioneers of today's all-female rock bands - and left again in 1991. After that, she played in bands like THE RUNESTERS (who played live and recorded several demos) and CC RYDER, before going back to GIRLSCHOOL in 1993 (until 2000). In 2004, she joined the punk rock band ROCK 'N' ROLL GYPSIES, led by Mat Sargent (formerly SHAM 69/SPLODGE bassist). That's a short update about Tracey Lamb's career, but what about ROCK GODDESS, after the departure of this female bass animal? The band shows up with 'stand in' bassplayer Kelly Johnson of GIRLSCHOOL during a German TV appearance. In '83 tho', ROCK GODDESS present Dee O'Malley as Tracy's replacement. It's also Dee, who handles the bass on their second album, called "Hell Hath No Fury". The LP was released with two different covers. One with a band photo and another one with a drawing on the cover sleeve. Also the songs are sligthly different. "Hell Hath No Fury" and the GARY GLITTER cover "I Didn't Know I Loved You Till I Saw You Rock And Roll" are on the American version, whereas on the European pressing (with the drawing) these songs are being replaced by "No More" and "Seen It All Before". The GARY GLITTER cover is the first single taken off the album c/w "Hell Hath No Fury". The single was also released as a full color shaped picture disc. The promotional tour for "Hell Hath.." brings the girls on the road with Y&T and IRON MAIDEN (great names to tour with, don't you think so?). In the same year, Jody Turner is to be heard as a background vocalist on the TANK LP "This Means War", together with Mick Tukker (WHITE SPIRIT) and Denise Dufort (GIRLSCHOOL). In '84 and '85, they recorded some songs; first with Chris Tsangarides (who also played keyboards on "Hell Hath..", by the way) and next with Paul Samson. Unfortunately, none of these recordings have ever been released on vinyl. In France however, the band is still very popular and they support SPIDER and SAXON in '84. Dark clouds pack together for the Turner sisters in '86. Their deal with A&M expires. Also, bass player Dee O'Malley gets pregnant and she leaves the band to become a full-time mother. Then in '87, the French label JID brings out the '85 sessions the band did with Paul Samson. The album's called "Young And Free" and it's released in France only. 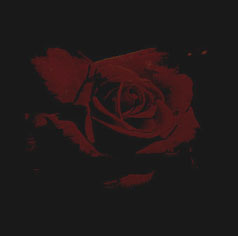 The only single from the album, "Love Has Passed Me By" c/w "Just In" was already released in '86. It shows us a very commercial sounding ROCK GODDESS. For the die-hard fans, it's a nice to have album, but the album is only a glimpse of what once was such a successful band. Inbetween, the girls sing background vocals on Paul Samson's EMPIRE album "Joint Forces" ('86) and Jody appears on the TYTAN song "Women On The Frontline" ('85; from the album "Rough Justice"). With the release of "Young And Free", ROCK GODDESS supports SAMURAI in the UK, but they get almost yelled away for the commercial songs they're playing from this album. After the departure of Dee O'Malley, the band finds a new bassplayer in Julia Longman (ex-PDQ) and keyboard player Becky Axten is added to the band as well. After a tour of nearly half a year, in the fall of '87, the story of ROCK GODDESS ends abruptly, when the band gets disbanded. Already in '88, Jody Turner returns with sister Julie under the name of THE JODY TURNER BAND. However, this time it's not an all-female outfit. The band is completed with Phil Manley-Reeve on bass and Ex-MAMMOTH bassplayer Gavin Taylor. Live, they play songs like "Kiss Yourself Goodbye", "The Game Is Up", "I'm No Angel" and "The Blonde Is Dead" (a tribute to MARYLIN MONROE) and the only ROCK GODDESS song, "Will You Take Me Home Tonight?". They change their name into TURNER, but the band disappears very quickly. Until somewhere in '94, when we see ROCK GODDESS in a comeback line-up. Of course Jody Turner sings and plays guitar, but Julie is the missing link. The band is completed by Aki Shibahara (bass), Nicola Shaw (drums; formerly SISTERHOOD) and Izabella Fronzoni (guitar; formerly ICE AGE). The last thing, we can track down, is this line-up changed their name in '95 into BRAINDANCE (UK). That's where our trail stops. A tragic ending of such a good starting career. We want to add just a few things to this story. First of all, we want to warn you for a second band, called SHE featuring Karin McInulty, Billy Germaney, Ken Riley, Lee Robertson and Paul Defty. They released a 7" called "Never Surrender" on Neat records. This SHE has got nothing to do with the Tracy Lamb outfit!! Furthermore, the question rises whatever happened to the '84 recordings of ROCK GODDESS with Chris Tsangarides? Recordings which would contain guest contributions of Darren Wharton (ex-THIN LIZZY/DARE) and the migthy THOR on the new version of "Heavy Metal Rock'n'Roll", now called "Rock 'n' Roll '85". And whatever happened to the CHER cover "Bang Bang" from their live shows? Fact is, the spirit of ROCK GODDESS still lives on! Reason enough for Renaissance Records to re-issue their first two albums on 1 CD this year. Does this mean the beginning of a brand new chapter in the Goddessa file? Only time will tell. Whatever they're working on at the moment, we would like to wish them all the best and lots of success for the future. If they ever return to the scene, we will be the firsts to tell you about it. Rock Goddess/Hell Hath No Fury ('98 Renaissance Records; reissue of first two albums on CD) 7"&12"